I spent about ten days in early April visiting friends and doing some sightseeing on Maui and the Big Island of Hawai’i. Since I’d been to the islands a number of times before, I found myself looking for a few new things to do – so why not visit every winery in the state of Hawai’i! Of course, that’s not so difficult when there are only two of them, one each conveniently located for me on Maui and the Big Island. I’d visited both wineries before but it had been many years since I’d stopped at either of them. Wineries and vineyards are not new to Hawai’i – Don Francisco de Paula y Marín, who introduced pineapples and coffee to the islands, is also credited with planting the first grapevines there in 1815, and with producing wine and brandy for King Kamehameha I. Kaumana Winery, on the lower slopes of Mauna Loa volcano on the Big Island, grew Isabella grapes and made wine prior to Prohibition. But since then, I believe the only true commercial wineries in the islands have been Tedeschi Vineyards, launched in 1974 on Maui, and Volcano Winery on the Big Island, which was founded in 1986. Maui and the Big Island may be the only two Hawaiian islands where commercial winegrape growing is feasible, since both have many more higher-elevation sites that are not nearly as hot or humid as the coastal areas. Tedeschi Vineyards is located at an elevation of around 2,000 feet on the slopes of Haleakalā, the huge dormant volcano that dominates the eastern half of Maui. 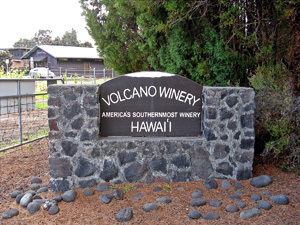 Volcano Winery is situated at about a 4,000-foot elevation, upslope from the active Kīlauea volcano. One significant problem with growing grapes in a tropical climate is that there are few areas where it will get cold enough for the vines to have a true dormant phase, so budbreak can be unpredictable and difficult to manage. Certain cultivars have proven to be better-suited to Hawai’i, with Symphony and Carnelian being among the ones that are noted to be more successful. No doubt different viticultural practices are needed for success in the vineyard, although I did not have a chance to discuss this during my winery visits. On my first day after flying from San Francisco to Maui, I decided to make the long, tortuous drive along the Hana Highway. The scenery is beautiful, with lush vegetation and lots of waterfalls, but after finally arriving in the Hana area and enjoying the sights there and in nearby ‘Ohe’o Gulch, I was not looking forward to driving back the same way. Fortunately, the road that loops around the south side of eastern Maui was open again – it had been closed for repairs on my two previous visits to Maui. It’s a different type of scenery here, in the rain shadow of Haleakalā, but it has its own stark beauty. After driving through this sparsely-populated part of the island and then climbing up the slopes of the mountain to “Upcountry” Maui, the first real sign of civilization is ‘Ulupalakua Ranch. There, just across from the Ranch Store, is the tasting room of Tedeschi Vineyards. In 1974, ‘Ulupalakua Ranch, owned by the Erdman family, and Californian Emil Tedeschi planted the first vineyard on the volcanic soils about a mile from the current tasting room. The winery’s 23 acres of vineyards currently include Syrah, Carnelian, Malbec, Chenin Blanc, Chardonnay, and Viognier. The winery also supplements this with some California juice. While waiting for the vines to mature, they first made a sparkling wine made from pineapples, and then in 1977 they produced the first “Maui Blanc” still pineapple wine, which continues to be the hallmark of the winery today. The pineapple wines are still made from Maui-grown pineapples, which is notable since pineapple production on Maui is only a tiny fraction of what it was in the 1970’s. The first wine from their estate vineyard fruit – a sparkler – was released in 1984. Tedeschi’s sparkling wines are all produced using the traditional Méthode Champenoise. These days, the winery goes under the name “Maui’s Winery” as much as it does Tedeschi. This makes sense in that Emil Tedeschi left the business some years ago to return to his family’s vineyard and winery near Calistoga, as well as to emphasize the Maui connection. “Maui Splash!”: Made mainly from pineapple, along with passionfruit. Light straw color, with sweet pineapple and other tropical fruit aromas, this reminded me of canned pineapple rather than the fresh fruit. Very sweet and somewhat syrupy in the mouth, it was just too sugary for my liking. It was surprising to me to start out with (by far) the sweetest wine of the bunch, but I figured I’d go with the flow. “Maui Blanc”: A 100% pineapple wine. Very light color, the aromas were much closer to fresh pineapple than the first wine. Medium-light bodied on the palate, it had a fairly clean and refreshing finish. The wine was off-dry but nowhere near as overwhelmingly sweet as the “Maui Splash!” A pretty one-dimensional wine – pineapple and more pineapple – but that said, it was rather pleasant. You’d have to pick the right occasion for this wine, but for sitting under a beach umbrella on a warm day, it wouldn’t be bad at all. “Upcountry Gold”: 70% Chardonnay, 30% French Colombard, unoaked. Light color, with some citrus aromas but also some odd, green notes. Medium-bodied with decent acidity, the flavors echoed the aromatics, and it finished with that same greenness that was apparent in the nose. I was hoping for more from this wine. “Ulupalakua Red”: 73% Merlot, 25% Syrah, 2% Petite Sirah. Medium-dark color, showing bright cherry, raspberry, and earth. Medium-bodied with a bright and lively mouthfeel, the finish was smooth and not too tannic. This was a pretty good red blend that would go well with burgers or pizza. At $15, it’s not especially a bargain for a “pizza wine,” but factor in the novelty of coming from a Maui winery and it’s not unreasonable. I rolled into the parking area and walked up to the historic building that houses the tasting room. The grounds are covered with stately trees, many of them well over a hundred years old. 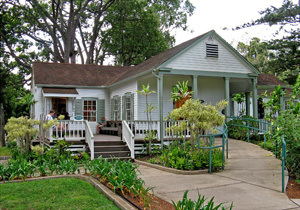 The tasting room is located in a guest cottage that was built in 1874 for Hawai’i's King Kalākaua, a frequent visitor to what was then known as Rose Ranch. 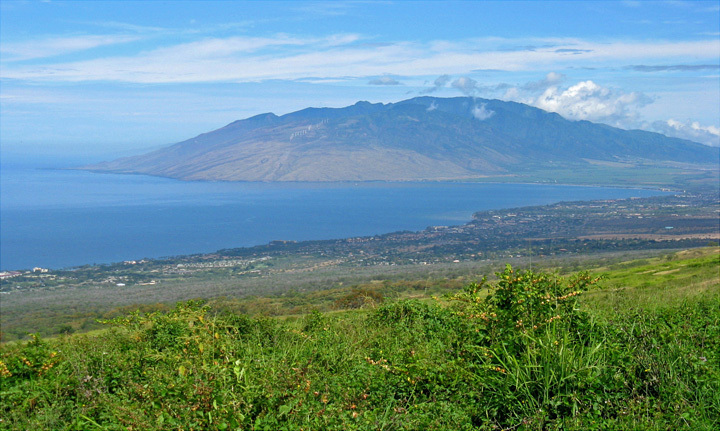 Part of the draw of this area must be the view – the ‘Ulupalakua area boasts what may be the most spectacular panoramic view on all of Maui. 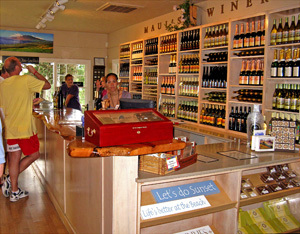 Tedeschi Vineyards is a popular destination for visitors to Maui – their website states that they have over 180,000 visitors a year, and the tasting room was accordingly a busy place. In addition to the tasting bar and gift area, one room of the cottage contains the ‘Ulupalakua Ranch History Room, with lots of interesting old photos and other displays. I was able to taste four wines at Tedeschi. My busy server didn’t have a lot of time to answer questions as I tasted, but I was able to learn a bit more about the winery and its wines. There are several other bottlings that I did not taste during my visit. Among these are the “Hula O'Maui” – a sparkling pineapple wine, “Rose Ranch Cuvée” – a sparkling Rosé made from Pinot Noir and Chardonnay, “Plantation Red” – a blend of Syrah and Carnelian entirely from the estate vineyard, and “Framboise” – a dessert wine made from raspberries, cane sugar and grape spirits.Some of the wines are sold only in the tasting room, though the “Maui Blanc” and “Maui Splash!” in particular enjoy wider distribution. All of the wine label artwork is done by Maui artists, andI should note that I did not see any appellations or vintage dates on the labels. Total annual production is around 30,000 cases. I really was not expecting a lot from the Tedeschi wines, but a couple of them rose above my expectations. Of the four wines, the “Ulupalakua Red” was my favorite. Since most of that blend was Merlot – which is not grown at the winery’s own vineyard – I must assume that most (if not all) of the grapes originated in California. And although it’s often disparaged in Maui travel guides, I thought the “Maui Blanc” pineapple wine was actually not a bad summertime sipper, though you have to adjust your palate to accept a wine with such strong pineapple flavor. All in all, visiting Tedeschi Vineyards is a worthwhile stop if you’re spending some time on Maui. Although it’s a long way from any of the main tourist areas, it’s scenic drive leading to a beautiful area with incredible views – that alone would make the trip a memorable one. And if you keep an open mind, some of the wines may just surprise you. After five days on Maui, I continued on to the Big Island, where I stayed in the Kailua-Kona area. By island standards, it’s a long, long drive from there to Hawai’i Volcanoes National Park – they don’t call it the Big Island for nothing. But the reward is the scenery at the park, which is unlike anything else you’ll see in the US. 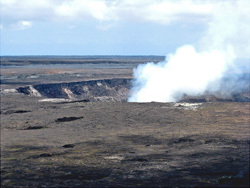 Since my last visit there a few years ago, the loop road around the Kīlauea volcano caldera has been partially closed, due to renewed activity at the Halema’uma’u crater, where a constant plume of volcanic smoke could be seen from the caldera rim. I continued from the Crater Rim Drive down the Chain of Craters Road leading down to the coast, where you can see the results of numerous lava flows from a flank vent of Kīlauea over the past 28 years. Pinot Grigio: Sourced from Sonoma Valley, this is Volcano’s first Pinot Grigio bottling. Very light color, showing tart green apple and mildly spicy aromas. Medium-light weight in the mouth, with upfront fruit but a somewhat tart and harsh finish. Pinot Noir: Sourced from Sonoma Valley. Light garnet color, tart cranberry and red fruits on the nose. Fairly light-bodied, the flavors were rather sharp and acidic, and the whole package was just not very Pinot-like. Maybe given some time for the acidity to mellow, this might turn into something better, but it was not very enjoyable when I tried it. “Volcano Red”: A blend of Cabernet Sauvignon, Merlot, Zinfandel, and jaboticaba berries. Light garnet color, with ripe strawberry, bing cherry, and some intriguing spices (from the berries?). Medium-light bodied, this was fruit-forward and tasty, with the spice component really carrying through on the finish. Distinctive, and probably a pretty good burger wine, although at $17 it may be a little pricey for what it is. “Symphony Mele”: This is an off-dry version (2.5% RS) of Symphony (which is a cross between Grenache Gris and Muscat of Alexandria). Light straw color, featuring perfumed Muscat-like aromas, peach and apricot fruit, and a touch of spice. Medium-light weight with a pleasant but not overbearing sweetness, this would be a tasty summer sipping wine. “Volcano Blush”: A blend of Palomino, Sauvignon Blanc, French Colombard, and jaboticaba berries. Very light peach/salmon color – the berries give this wine its color. Displaying cranberry and cherry fruit, this was a bit sweeter than the “Symphony Mele” but not overly sweet. The residual sugar clashed somewhat with tart cherry flavors on the finish. “Hawaiian Guava-Grape Wine”: Made from about 30-40% yellow guava with the rest being a blend of white grape varieties. Light straw color, with intense fresh ripe guava aromas, quite floral. Sweeter and more viscous than the previous two wines, this tasted like fresh guava juice with a kick. Like the pineapple wine at Tedeschi, this was rather one-dimensional, but if you like guavas, you’ll probably find this wine quite pleasant. I could see this working on its own as a dessert wine or possibly with spicy foods. “Macadamia Nut Honey Wine”: This is actually a mead rather than a wine, made form macadamia nut blossom honey. Extremely light appearance, almost colorless. Aromas of honey, flowers, with a hint of cocoa and a nutty note. Sweet and rich on the palate, with the honey and nut components continuing on the finish. All the parts sound good, but somehow they didn’t seem to blend together well and ultimately I didn’t find this as enjoyable as I’d hoped it would be. “Infusion”: This is the “Macadamia Nut Honey Wine” infused with black tea. Light-medium gold color, this had an intense black tea aroma – the tea overwhelmed the character of the previous wine. Fairly viscous, the flavors are all sweet black tea, and there’s some typical black tea bitterness on the finish. Seems like an interesting idea that didn’t work as well as it might have – perhaps cutting back on the black tea infusion would have produced a more harmonious result. The winery suggests this as an apéritif, and it does contain some caffeine from the tea. After my visit to the National Park, I turned off the main highway not far from the park entrance. There in the small town of Volcano, I continued to the end of a small road until I reached Volcano Winery. The winery was started in 1986 by Lynn “Doc” McKinney, a retired veterinarian from O’ahu. He’d made wine and beer as a hobby and thought the Big Island would be a suitable spot for a vineyard and winery. He originally planted a few Symphony vines there, and before long, the vineyard expanded to 14 acres. Along with the grapes from the vineyard, local tropical fruits such as starfruit, passionfruit, and papaya were used to make wines. In addition, honey-based wines – or meads – were made from lehua blossoms and macadamia nut blossoms. The tasting room opened to the public in 1993, and it now hosts more than 40,000 visitors per year. Doc McKinney sold the winery in 1999 to Del Bothof, whose family still runs the business. After entering the spacious but casual tasting room, I was greeted by Robin Lawrence, who was behind the wood tasting bar. Robin told me that Volcano Winery now has 20 acres planted with grapevines, located not too far from the winery. They grow Cayuga White, Symphony, Chambourcin, Marechal Foch, Pinot Noir, and Syrah – three Vitus Vinifera varieties and three hybrids. The winery supplements their own fruit with juice obtained from Sonoma Valley. There is a small demonstration vineyard just outside the winery tasting room. 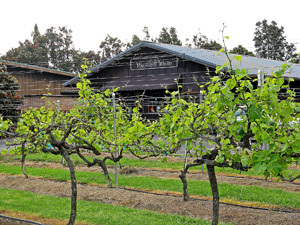 Robin said that the winery started growing Pinot Noir in 2004, and that they produce some limited-edition Pinot Noir bottlings from their own fruit (they were sold out of their most recent bottling when I was there). The total wine production is about 5-6,000 cases per year. As I was tasting the Volcano wines, I asked Robin what were the most difficult things about growing grapes in that area. She said that the thin soil – it’s quite rocky below the shallow volcanic topsoil – and dealing with sulfur fumes from the volcano were some of the toughest issues. The fumes usually blow in the other direction, but Robin said when the wind changes and carries the sulfur fumes through the vineyard, it can be like acid rain on the vines. It’s certainly not the easiest place to grow grapes. Volcano still produces wines that include non-grape sources, such as bottlings that feature locally-grown guava, jaboticaba berries, macadamia nut blossom honey, and black tea. 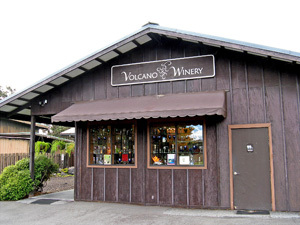 The Volcano tasting room included the usual assortment of wine accessories, logo clothing, and local gourmet food items. The wines there were tasted in tiny cordial-style glasses, which made it tough to get much aromatic impact from the wines. The first three wines were dry, and from there we proceeded on to wines with increasing percentages of residual sugar. As with the wines at Tedeschi, I did not spot any vintage dates on the labels, though there were appellations indicated – “American” for the first two wines and “Hawaii” for the others. I tasted eight wines in all, and they included a few that I thought were fairly good as well as some that frankly struck me as odd. I liked the “Volcano Red” – a blend of red grapes (most likely from California) and local jaboticaba berries. And I also thought a couple of the sweeter wines, the “Symphony Mele” and the “Hawaiian Guava-Grape Wine” – that one made with fermented guava plus white grape varieties – were tasty. Ordinarily, Volcano Winery might not be worth going out of your way for. But since the tasting room is so close to Hawai’i Volcanoes National Park, if you’re visiting the park – and if you’re on the Big Island, you have to visit there – you should consider taking a little extra time and stopping in at the winery as well. You’re sure to taste something a little different there, and you might just find something that strikes your fancy. The wines I tasted at Tedeschi and Volcano were not great wines by any means, but considering all of the inherent difficulties of making wine in Hawai’i, I think the point of many of the wines was to produce something original and unique rather than aim for world-class wines. You’re likely to taste wines that are very different than any you’ve ever tried before. If you accept that and are open to wines that are considerably out of the mainstream, you may find some that are quite interesting – in a good way.